I have been loving pineapple in my smoothies lately. All winter I was going for frozen blueberries all the time in my smoothies, but now that the weather it starting…slowly…to get a bit brighter and sunnier, pineapple just seemed more appropriate. It gives that tropical flare to everything you add it to. Light, summery, and refreshing. Plus it is beautifully bright and yellow which is my second favorite color after orange! You know I love bright summer colors (i.e. sunshine!) and pineapple is the quint-essential sunshine fruit, am I right? + Tastes pretty damn amazing too! I don’t know if it is just me, but when I eat cut up pineapple, I really have to cut it up in small pieces. Why? Because if the pineapple touches the corners of my mouth/lips, it causes these weird sore/cut on the corner of my mouth. So I have to fork in the pineapple directly in the center of my mouth so this doesn’t happen. Weird right? That’s why having it in smoothie form is so much easier, haha! I also don’t have exact measurements for this smoothie. Smoothies really don’t need measurements. It is really all to taste, texture/thickness preference. Once you have a good combo of ingreindts that go well toegther, the amounts really don’t matter much. Really, who actually measures out their smoothie ingredients? Yea, maybe you measure out any protein poewders or superfoods you add, but otherwise I know no one has time for measuring out anything else. Just throw it all in there and blend away! 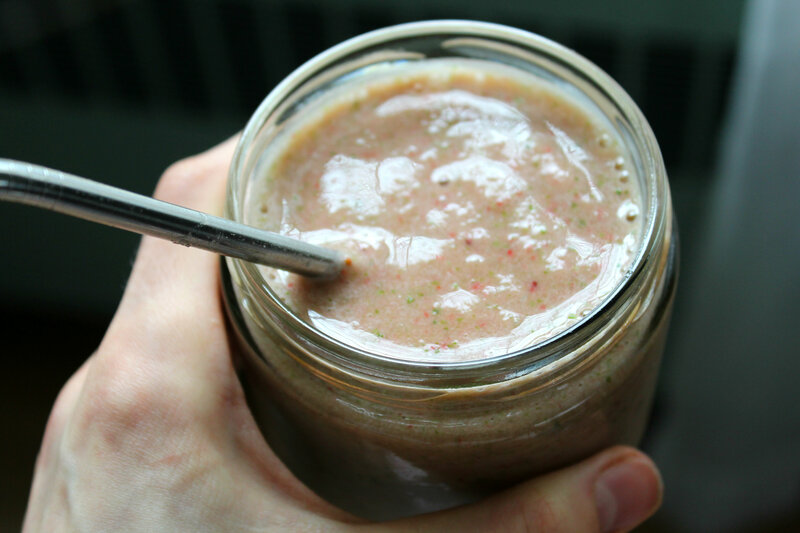 That’s why smoothies are quick easy go-to meals or snacks. They should take no time at all to make! + Add your Romaine first, then the frozen fruit, powders, and finally water and ice cubes. Blend, Blend, Blend! Simple and refreshing! I don’t like overly complicated smoothies. I like clean simple fresh tastes with minimal ingredients. Just pick a fruit or two, greens, and water. But I do like to add in protein powder so I don’t get a sugar-carb crash and I feel more sustained. 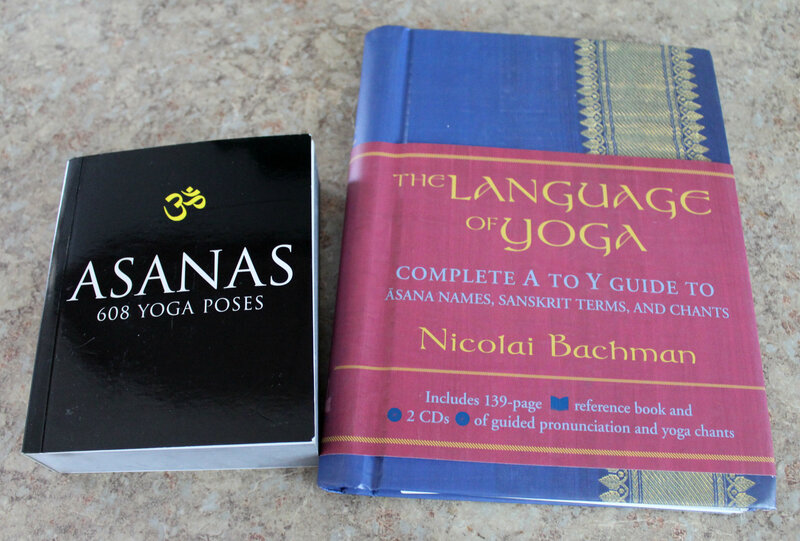 In other news I am loving my new yoga books I got from Amazon! They make me feel like I have elevated my “yogi” status, haha! Asanas 608 Yoga Poses is really awesome. 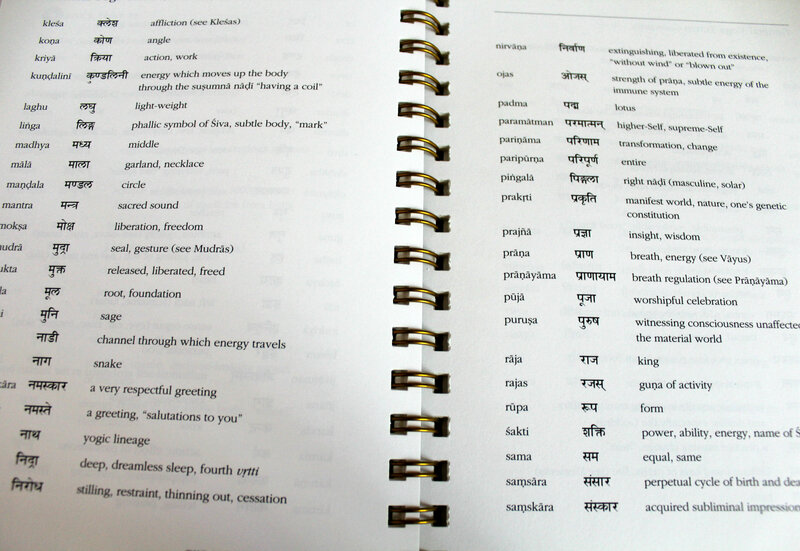 Each page has a pose and the name. So much to try! I can’t wait to take new yogi pose pictures this summer. But I do feel a bit awkward flipping through this book. Little did I know when I ordered it was that the poses are done by a man. Not just a man, but he is basically naked. See for yourself (mind you this is a less graphic pose. Some are pretty “revealing”, hahahaha!) Ah, the beauty of the human form, ey? Yup, so smoothies and yoga books! Happy random Tuesday to you all 🙂 Remember to check out the 2014 Gluten-Free Challenge post! I would love it if you would join! + Does Pineapple burn the corners of you mouth too? Please tell me I am not the only crazy person here! + What is the last book you read? Thank you so much love! 🙂 you just put a smile on my face! Haha and that’s great! Make sure to pack tons of spinach in their, and even try frozen cucumber too. Totally tasteless, but even more nutrients! 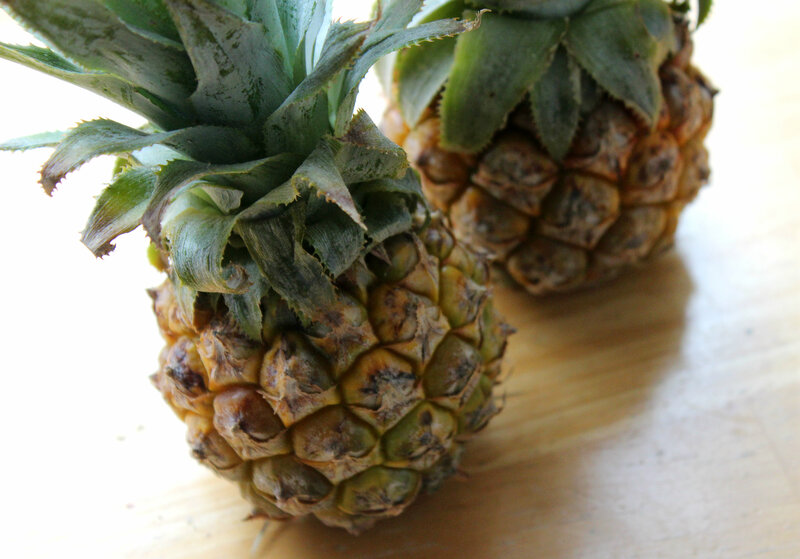 We must be thinking alike – i just wrote a article on pineapple and yogurt. I love it! Thanks for sharing on Real Food Fridays Blog Hop. Have a healthy happy weekend! It is! When I get the craving for Pineapple it usually lasts for a few weeks and then I forget about it again! Hahaha! I am so surprised/happy to see I am not the only one who’s experienced this! This is right up my alley!!!!! I will be making it asap! Yes pineapple burns my mouth, and it actually makes my tongue bleed! I’m not talking like a whole pineapple, but even just a few slices!! it doesn’t hurt (unless I really eat a lot) but it’s pretty weird. I was scared when I first realized!! I’m super sensitive to bromelain I’ve learned… I once used a face cleanser with it in the ingredients and let’s just say my irritated red skin was not the “glow” I was after!! O gosh! Yea, my body is so sensitive to everything and so is my skin. It is so sad…such a great food, but causes some unhappy things! That smoothie sounds really good!! I’ve never found that pineapple cuts the corners of my mouth, but I have always found it so fibrous when eaten raw. I love the texture of pineapple! Soft but “crunchy”. You know, I went all last summer only using frozen pineapple….that needs to change this summer..or more like right now! yum! 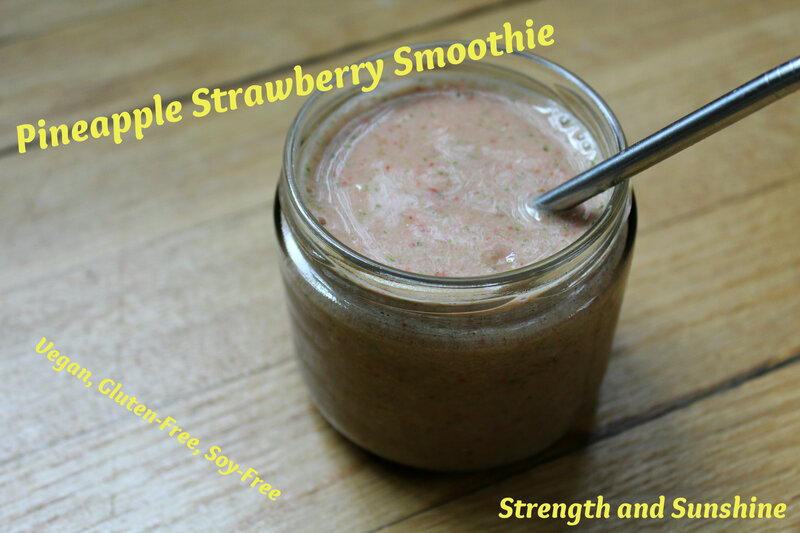 pineapple and strawberry sound like a wonderful combination! and perfect for these warmer months! Definitely! I always love breaking out pineapple, mango, and other citrusy type smoothies for the warmer months! 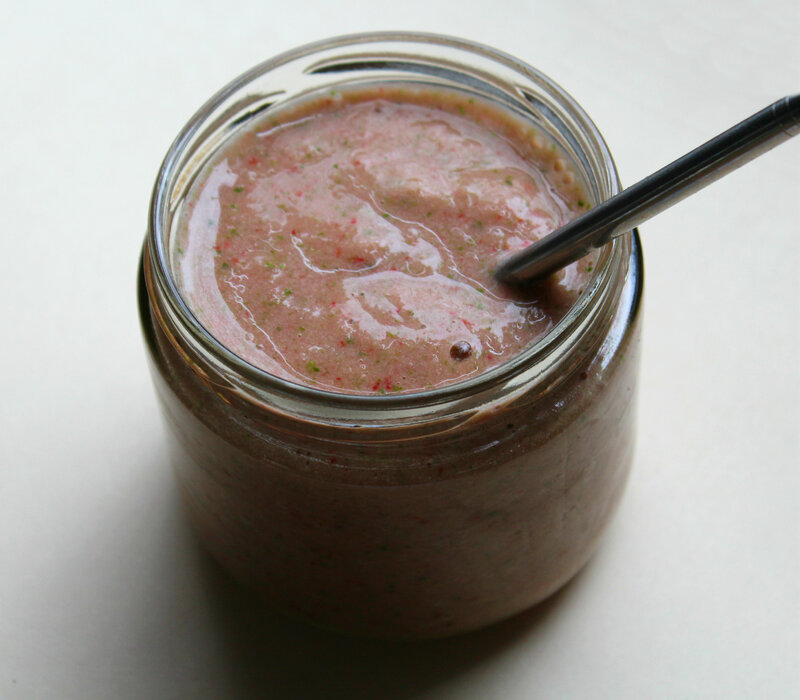 Mmmm i do love pineapple in my smoothies… eating them alone though, not so much! Just like you, it burns my mouth. To acidic for me! Yes, I love the flavor, but it always messes with my acid reflux really bad!